Divergent is a 2014 American science fiction action film directed by Neil Burger, based on the novel of the same name by Veronica Roth. 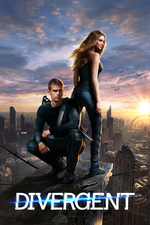 The film is the first installment in The Divergent Series . It stars Shailene Woodley, Theo James, Ashley Judd, Jai Courtney, Ray Stevenson, Zoë Kravitz, Miles Teller, Tony Goldwyn, Maggie Q and Kate Winslet. I liked the movie, but I didn't like some changes from the book, especially the death of Natalie Prior. In the book she leads the Dauntless members away from Tris, in the movie she's shot dead while firing back beside Tris. I feel that in the book it is more of a sacrifice she makes to save Tris. Sorry to poop on this movie, but it was such a trite mess. I think The Onion nailed it. Yes, the movie is a bit of a mess, the book is better. But I really like Shailene Woodley as Tris. I haven't read the books, but my main problem with the set-up of the movie is that Dauntless seemed like the least interesting faction. I kept hoping that Tris would be cast out and start organizing the Factionless. Instead, the first half is like a long training montage, and all the intrigue is happening off screen to other characters. The first book's fun. The second so-so, the third is a complete mess. I don't think the movies will improve on this. See also: hunger games, exact same arc. This movie finally made it to cable, and since I had just finished a Silicon Valley catch-up marathon, I decided to sit through this, which came on next. I know the source material is a series of YA novels, but it seemed so juvenile. Especially the first half, which reminded me of the “High school is such a serious thing” gag from Family Guy. The second half was much better. I was very impressed with Shailene Woodley's performance. I guess the thing that bothered me most was that the faction system doesn't seem like something people would actually intentionally set up. Hunger Games and City of Ember weren't realistic either, but the systems in them seem like something people might actually do. I know it's meant to be an allegory — Four's tattoo monologue makes that perfectly clear — but it's a little too on the nose. Right down to the, “I'm divergent!” tagline. When her dad & the other Abnegations storm the stronghold near the end, guns a-blazing, I was finally excited for this thing, anticipating that there would be a reveal that the Abnegations (*including* her parents) really did want to rule the entire system with an iron fist, leaving the heroine and the audience in a moral dilemma and setting up the next movie -- now the bad guy is your own dad, and you helped him win! Instead he dies off-screen and sad violin music plays before a boring and predictable climax, and the people you thought were good were good and the people you thought were bad were bad. Yawn.